Japanese knotweed is a non-native invasive plant species governed by legislation and is a risk to property. 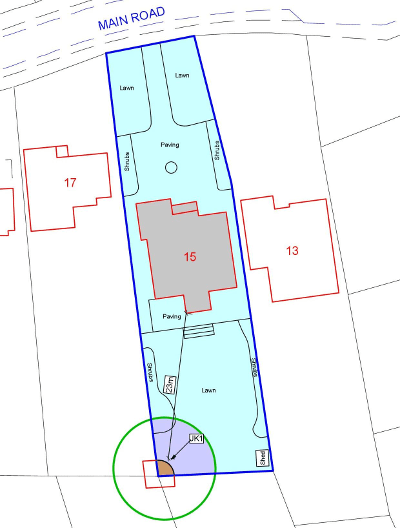 boundaries of the property or close to the boundary on an adjacent property. If you are selling or buying a property that is affected by Japanese knotweed it would be prudent to obtain a Japanese knotweed survey to obtain a Japanese knotweed survey and report. A survey will provide a formal Japanese knotweed identification, an accurate record of where the knotweed is located, the extent of the risk zones and remedial feasibility study. To help understand and categorise the level of risk that the knotweed presents to the property, the Royal Institution of Chartered Surveyors (RICS) have created a “risk” table (see table below). The level of risk is defined by the proximity of the knotweed to the habitable area or the property boundary and if any structural damage has been caused. *The Japanese knotweed survey is FREE, but if we find 'no knotweed' within the property and then additionally we find that the property is 'not affected by knotweed' present in neighbouring properties, we will charge £140 +VAT for the call out (i.e. £168). A professional Japanese knotweed identification, detailed account of our findings, photographs, location plan and confirmation on the knotweed RICS property risk category will all be included in a Knotweed Management Plan (KMP) proposal. This will include a record of any visible signs of damage caused by the knotweed to the buildings, ancillary structures or hard standing/paving. The KMP will quantify the extent of the problem and may also identify knotweed in neighbouring gardens. It will include the cost of remedial works and guarantees to enable you to establish the true and realistic costs. This applies for all mainland counties in England, Scotland and Wales.